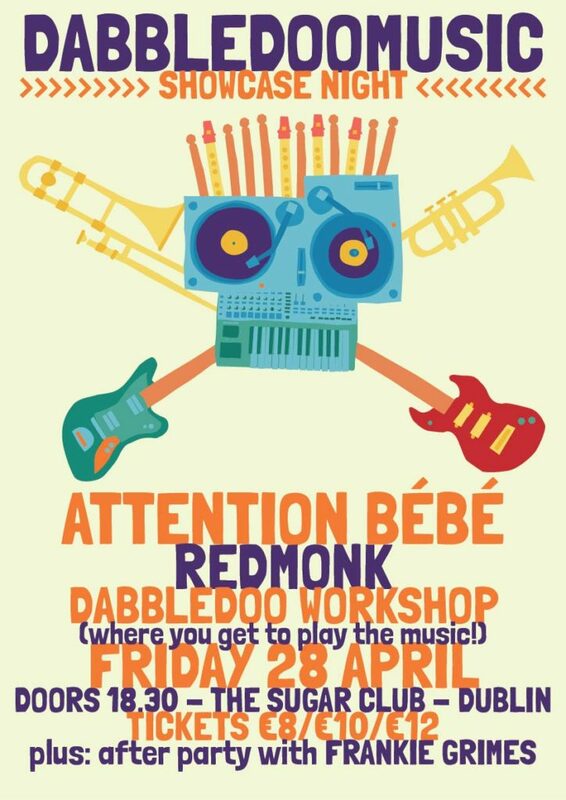 Redmonks Website» Blog Archive » DabbledooMusic Showcase Night! We’re having a whopper year in Dabbledoo HQ, no small thanks to the wonderful people at Social Entrepreneurs Ireland and the Elevator programme that they run, and that we’ve been part of since October last year. Sounds like an excuse for a session, doesn’t it? HELLS YUSSSSS. 7-8: DabbledooMusic Workshop – this is our first ever workshop for adults so get down early if you want to take part, we’ll be supplying the instruments and taking you through our music education method! 8-9: DJ set from yours truly giving you the breaks and beats you needs for your hips and feets. Picked up some SERIOUS records of late so need to break em in, yeah? 9-11: Hotstepping 90s party goodtimes with ATTENTION BÉBÉ – dress to sweat! PLUS: If you haven’t danced enough we’ll be throwing an afterparty NOT TOO FAR AWAY with FRANKIE GRIMES aka SHABBA FRANKS. We’ll be posting details bout that soooon. Tickets (including limited number of early bird specials) available here. Facebuke event page here. This entry was posted on Thursday, March 30th, 2017 at 8:19 am and is filed under DabbledooMusic, Music. You can follow any responses to this entry through the RSS 2.0 feed. Both comments and pings are currently closed.